I did this first layer of colors in the gloom of the evening, after work. I was tired but had played out some of the painting earlier in the day in between whatever I was doing. I used a small brush and deliberately tried – and will continue to try – a delicate approach. 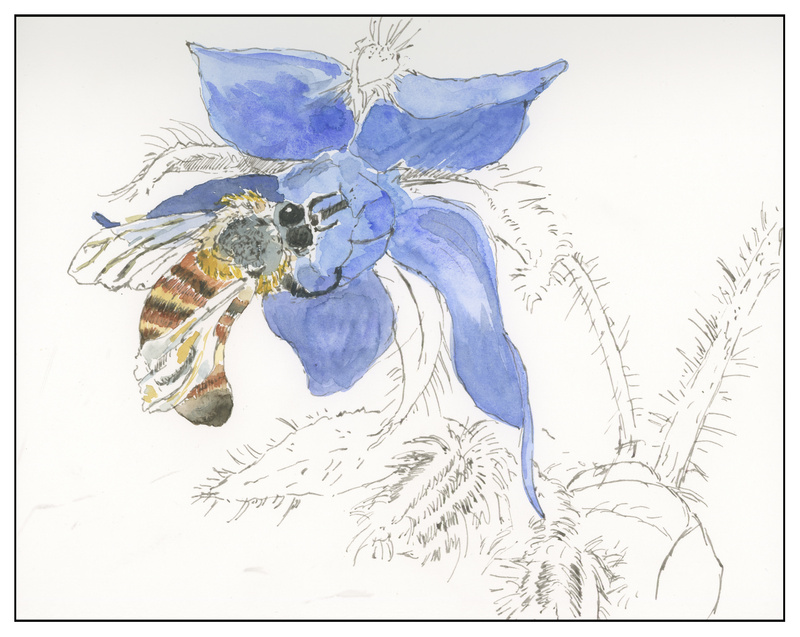 Both the bee and the borage have a lot of fine hairs which I want to express and preserve. Looking at the scan shows a need for contrast in the center of the flower, along with on the bee’s back, behind the eyes. In these areas, I will be working on glazes to create better contrast, and I hope a better sense of depth. As it stands now, the whole painting is rather flat and nondimensional to my eye. Getting close to the end . . . not so sure now! Thanks, Sharon.